When you have children, your home will change. Some parents handle this change better than others. Mess will start to appear everywhere and anywhere. You have two possibilities for dealing with this. Either you can accept the inevitable. Or, you can fight back. Personally, I always encourage parents to fight back against the mess and disorder kids bring. A lot of stylists will tell you it’s difficult to have a house that looks modern and stylish when you have children. Difficult maybe, but it’s certainly not impossible. You just need to put the work in and think about the type of features that you need. At the same time however, you must style your home so that it suits the needs of your family and your children. It needs to be safe, practical and durable while still looking stunning. With that in mind, on this post I’m going to tell you everything you need to know. Hopefully, once you’ve finished reading you’ll be able to make sure your home is stylish without making it a nightmare for kids to live in. So, let’s get started with a simple tip that I’m sure you’ll love. You might wonder why I’m saying this and I’ll tell you. The biggest threat to hardwood floors is shoes. If you wear shoes on hardwood floors you can scuff them, scratch them and make them look worn and old. Luckily, there are simple ways to avoid this issue. You just need to make sure that people are not allowed to wear shoes in your home. The good thing about hardwood floors is that they are remarkably easy to clean and will almost never stain. You can get any spill up quickly without a fuss. I think as a parent you’ll immediately see the benefit of that possibility. That’s why I recommend you have hardwood floors is as many places of your home as you can. The only place I wouldn’t necessarily recommend it is upstairs. If you have hardwood floors upstairs people just walking around is suddenly going to become very loud. Besides as long as you don’t have food upstairs, there’s really no need for them. The other issue to consider with hardwood floors is that they can get quite cold in the winter. That’s why you may want to think about underfloor heaters. Particularly, if you live in a place where the weather isn’t always hot. As I said, when you have children mess in your home is going to start to appear everywhere. It might be a few toys. Or, it could be games and accessories. Either way, your home is going to look a jumble and a mess. I know how painful this can be and I have the solution. Houses often look cluttered because there is too many pieces of furniture and too many accessories. If this is the case, it’s easy for your house to look a state. To avoid this, you just have to limit the number of items within each room. If you like, you can put the furniture out of the way in the attic. Or, you can simply sell it on. There really is no need for having a higher number of seats in a room than the number of people in your family. If you have guests over you can simply bring the furniture back down from the attic. But if you want to keep your home looking stylish, put it out of the way for now. 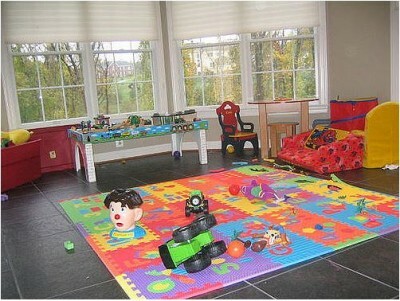 Of course, another possibility to avoid mess in the home is to set up a room specifically for your kids. This is a place where adults won’t go and wouldn’t want to. But your kids will love it. You can fill it with everything they need from comfy furniture to messy areas. If you’re looking for kids furniture browse www.comfysacks.com/kids.html for ideas. I think you’ll find most children would love a bean bag chair in their playroom. As well as this, you should put their games and toys in this room as well. Once the room is complete, you will again have two options. You can either pretend this room in your home doesn’t exist. That way it doesn’t matter how much of a mess it is because you’ll never see it. Or, you can make sure it’s suitable for cleaning. The first thing I’d suggest is a disposable floor. You can put down paper or rags when it’s in use. When the room isn’t being used the rags can be disposed of. The room will then look beautiful. To make sure it doesn’t always look a mess, you can use child storage containers. These can be purchased with images of their favourite characters. They are also covered in material so that they blend in naturally like part of the room. You might find that you don’t have the space for a child’s playroom in your home. If that’s the case you can either consider an extension or a conversion. Converting your loft into a playroom is perhaps the perfect choice. That way, it will be completely out of the way and almost entirely cut off from the rest of your house. Do this, and you won’t have to worry about seeing any mess. You will probably hardly ever go up there. But you will have to spend some time converting it and making it safe for your children to use. There are companies online that will provide you with the conversion services you need. Check out on www.granadaloft.com for more info. You’ll be able to quickly adapt the loft into a playroom on a cost friendly budget. Your biggest problem with be letting this room go as a playroom when it could make a stunning place for guests. It’s all well and good thinking about how to make your home beautiful and stylish. But when you have kids you also need to ensure that it’s safe. One of the most dangerous rooms in the home for your children is the kitchen. There are a whole variety of ways that children can hurt themselves in the kitchen. For instance, I know a lot of adults want to teach their kids to cook quite early. It’s good for them to learn because it allows them to develop independence a little more rapidly. At the same time however, hobs are dangerous. Particularly if they heat the whole service rather than underneath the pan. Similarly, in a kitchen without much space it’s easy to burn your hand when you’re getting something out the oven. That’s why I’d suggest two awesome features for your kitchen. They look great and they’ll make the place a lot more safe. The first is a heat induction hob. Heat induction hobs are brilliant because they only heat underneath whatever pan you are using. Not only does this reduce the chances of burns, it saves money too! The second feature is an oven with a door that slides underneath, out of sight. Again, this reduces the chance of burns. But if you have a small kitchen it will also make it seem a little larger. For other upgrades to your kitchen for your family, you could consider adding a breakfast bar or island. This will provide the perfect place for your families to eat meals together in the morning and evening. Not only that, it looks good as well. Due to the fact that it’s integrated into the kitchen design it looks better than a table. These types of designs make your home perfect for children and they add a little value as well. It’s also worth pointing out some of the tech that you can add to your home to improve it for your kids. For instance, you could purchase a smart home control system. A smart home control will allow you to completely control your home at the click of a button. You can check them out on www.panasonic.com. It’s able to record individual preferences of your family members. Here’s an extreme example. An older mum might be going through the menopause. At this stage in life, your body starts to change and you’re not as susceptible to hot temperatures. This means that someone at this stage would prefer a room hot. While another might prefer it a lot colder. With a smart control both people can be accommodated as the temperature will change depending on who is in the room. It’s not the only thing that can be controlled using a smart control either. A smart control can be set up so that music plays when you enter a room or so that lights are dimmed to your preference. Finally, you may like to think about also adding smart locks to your home. Smart locks look modern and futuristic so they will add a touch of curb appeal to your property. But they are also one of the best ways to make your home secure. Using these tips your home will be the perfect place for children and it will still be stunning.